Declining numbers of visits to this weblog tell me a lot folk are getting busy with Christmas, either travelling, shopping or both. However, this will be a bitter Christmas for many families that are one way or another dependent on the energy industry, petroleum and gas in particular. The US Federal Reserve flagged a major turning point this week with a return to interest rate hikes. Currencies and commodities sank against the dollar across the board, confirming that the current market is here to stay a while longer. Of the more than 300 000 folk that lost their jobs in this industry since 2014 few will ever make it back; search for a new a career they must. I feel the best word to describe what is going on in middle management, administrative boards and petroleum ministries is panic. The market is out of control and no one - really no one - is safe at 37 $/b. From small to large companies, from multinationals to governments, everyone is bracing to what will be the deepest contraction of the petroleum (and gas) industry at least since 1985. 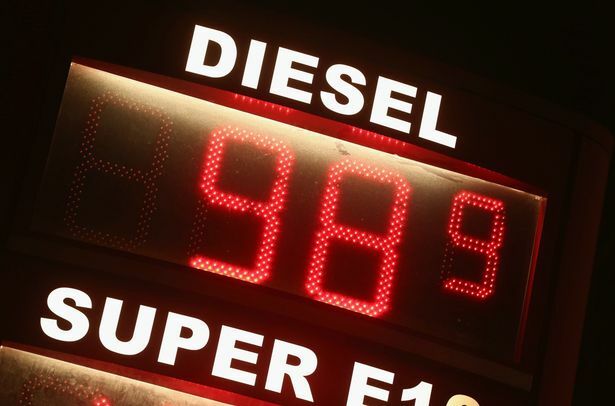 Here in Europe consumers are now paying the lowest prices in a decade for petrol and diesel. Enjoy it while you can. Petroleum will eventually come back in vengeance. Opec will be forced to call an emergency meeting within weeks to stabilize the market if crude prices fail to rebound after crashing to seven-year lows of $35 a barrel, two of the oil cartel's member states have warned. Emmanuel Kachikwu, Nigeria’s oil minister and Opec president until last week, said the group is still hoping that the market will recover by February as low prices squeeze out excess production from US shale, Russia and the North Sea, but nerves are beginning to fray. 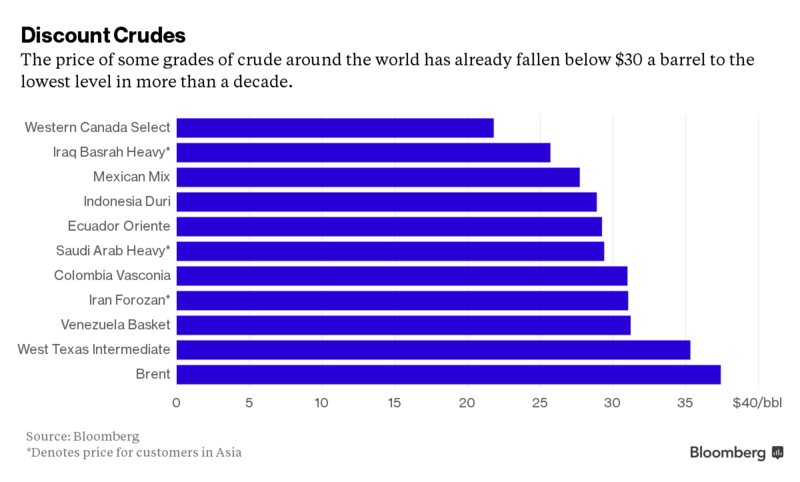 “If it [the oil price] doesn’t [recover], then obviously we’re in for a very urgent meeting,” he said. Indonesia has issued similar warnings over recent days, suggesting that the Opec majority may try to force a meeting if Saudi Arabia’s strategy of flooding the market pushes everybody into deeper crisis. [...]The oil market is now in the grip of speculative forces as hedge funds take out record short positions and exchange-traded funds (ETFs) liquidate paper holdings, making it extremely hard to read the underlying conditions. There is no place to hide from this petroleum price; from upstream to downstream the industry struggles. 2016 is likely to go in history as an year of great transformations in the petroleum industry (and perhaps the energy industry as a whole). Companies will disappear through mergers, acquisitions and bankruptcies. Investors around the world have seen $240 billion wiped off the value of oil companies in the week since OPEC sent crude prices plunging to a seven-year low by abandoning its output limit. Companies producing, refining, piping and exploring for oil, along with those that provide them with services, had a market value of about $3.72 trillion as of Friday, compared with $3.96 trillion on Dec. 3, the day before the Organization of Petroleum Exporting Countries’ meeting in Vienna. Exxon Mobil Corp., the world’s biggest oil company, has lost $11 billion of its value and PetroChina Co. more than $17 billion, according to data compiled by Bloomberg. Crude’s slump has lasted for more than 18 months, making it one of the longest downturns in decades and forcing companies to slash spending, reduce their workforce and delay projects. Energy companies are the worst performers in the MSCI World Index this year, even below miners that have suffered a slump in the price of commodities from iron ore to copper. What is more, some petroleum grades are being impacted even deeper than the Brent index itself. Remarkably, among the cheapest grades around seem to be those based on Canada's tar sands, which in effect are today at the head of the supply curve. Euan Mearns put up a depressed petroleum price scenario for 2016. There is some confusion between consumption and demand that might make this article hard to interpret, but in essence this forecast is based on continued rigidity of supply and demand. As for supply at least I expect otherwise; the present market will soon implode some of the segments at the head of the curve. And since I am at it, Euan Mearns is raising funds to keep his blog going in 2016, after more than 2 years on a full voluntary basis. While I many times disagree with what is published at Energy Matters, I believe the web would be a poorer place without it. Please contribute if you possibly can. Every year I have a bet with a good friend on where the Brent oil price will be in December the following year. Last year I estimated $56.50, my friend $99, so this year I am a clear winner, even though I’m out by about 49%. Brent is trading at $38 as I write. I can extract little satisfaction from this since I got “close” for the wrong reasons. Another report from the Post Carbon Institute is very clear in this regard: the segment of the supply curve corresponding to "shale oil" is already contracting. It will mostly vanish throughout 2016. Oil production in the Eagle Ford Play of southern Texas, the largest tight oil play in the U.S., is now falling after more than a year of low oil prices—but it has proven more resilient than many observers expected. This paper reviews the latest developments in the Eagle Ford Play and provides an update of the assessment in my Drilling Deeper report, which was published in October 2014 just as the turmoil in the oil markets began. In Eagle Ford Reality Check, David Hughes, author of Drilling Deeper (which likely remains the most thorough independent analysis of U.S. shale gas and tight oil production ever conducted) and a number of other reports on North American shale gas and tight oil production, looks at how production in the Eagle Ford has changed after a year of low oil prices. Oil production in the Eagle Ford is now falling after more than a year of low oil prices. The glory days of the Eagle Ford are behind it, at the ripe old age of six years. This paper reviews the latest developments in the Bakken Play and provides an update of the assessment in Drilling Deeper, which was published in October 2014 just as the turmoil in the oil markets began. In this particular article, the demise of American source rocks and tight reservoirs alone is projected to reach 5 Mb/d. To these will certainly add all sorts of heavy petroleums and much of the offshore resources around the world. While diplomats in Paris hash out a legally binding accord to significantly curb greenhouse gas emissions, oil is trading at a seven-year low, closing Tuesday below $40 per barrel. The price drop follows OPEC's failure to put a cap on oil production last week. Energy analysts predict prices could go lower in the next 12 months, but Dan Dicker, an oil analyst with The Street and OilPrice.com, says we could be in for a wild ride that will drive oil prices back up — way up. In geo-politics, Turkey's dash at Russia still dominates the news. In economic terms at least, Turkey seems to be at the bitter end of this stand off. Turkey has told the Reuters news agency that Russia has stopped work on its nuclear power plants. In reality, the Turks are exaggerating. The Russians haven’t really stopped—they have really only slowed down. It is another piece in the intensifying conflict that has enveloped Russia and Turkey over the downing of a Russian AU-24 slow moving bomber by a Turkish F-16 fighter jet. The nuclear deal began in 2013. The Turks promised to pay $20 billion and the Russian nuclear company Rosatom promised to build four 1,200 megawatt nuclear electrical power plants in Turkey. Now that Turkey tacitly cancelled the Turkish Stream after trying to pick up a war with Russia, the Council now sets eyes again on the Nord Stream. To a good extent the critics to the expansion of the northern route are well placed. It would be far preferable to connect the Eastern Mediterranean to the Caucasus, or even better, the Near East. This would eventually put Iran's gas in our way. Its critics, mainly in eastern Europe, say it will: increase dependence on Russia; harm Ukraine, by ripping €2 billion a year from its income; and violate the spirit of EU sanctions on Russia, which are designed to inflict pain in the energy and banking sectors. In spite of the profuse bombing campaign, the Russia military claim Daesh is still expanding its territories over Syria and Iraq. While there might be here some dose of hyperbolae, one should also note, once more, the tendency of the western media to downplay the threat and dimension of Daesh. The area of influence of the Islamic State terrorist group (outlawed in Russia) is expanding, militants have seized about 70% of Syria’s territory, Russian Defense Minister Sergey Shoigu said on Friday. "The Islamic State area of influence is expanding. Militants have seized about 70% of the Syrian territory. The number of terrorists amounts to about 60,000 people," he said. "There is a threat that their actions will be transferred to Central Asia and the Caucasus," the minister said. Deputy Defense Minister Anatoly Antonov earlier said that from 25,000 to 30,000 foreigners, including from Russia, were fighting in the ranks of Islamic State. The CIA estimated the number of militants at about 30,000 people, while the Iraqi government said there were 200,000 Islamic State fighters. Another article pointing to serious difficulties with the so called Free Syrian Army. This is the kind of news that seldom makes it to the mainstream press. The main Western-backed Arab rebel group in Syria appears on the verge of collapse because of low morale, desertions, and distrust of its leaders by the rank and file, threatening U.S. efforts to put together a ground force capable of defeating the Islamic State and negotiating an end to the Syrian civil war. “After five years of this war the people are just tired … and so are our fighters,” said Jaseen Salabeh, a volunteer in the Free Syrian Army, which was formed in September 2011 by defectors from the army of Syrian President Bashar Assad. The Free Syrian Army, or FSA, some of whose members are trained by the Central Intelligence Agency, is the biggest and most secular of the scores of rebel groups fighting the Assad government. Although defeating the Islamic State is the focus of Western attention, the U.S. believes there can be no lasting peace in Syria, and no elimination of the Islamic State there, as long as Assad remains in power. The circle is closing on the economic sanctions to Iran. The main illation I take from this story is that President Khatami likely inverted an old desire from some quarters to produce a nuclear weapon. The success in defusing this goal will probably go in History as a turning point for Iran, towards a proper place in the global political scene. Iran took a crucial step towards ending its confrontation with the West on Tuesday when America and its allies agreed to close an inquiry into the “possible military dimension” of Tehran's nuclear programme. After more than a decade of investigation, Yukiya Amano, the director of the International Atomic Energy Agency (IAEA), delivered his final verdict on the military side of Iran’s nuclear ambitions. He told the 35-members of the IAEA board that Iran “carried out activities relevant to the development of a nuclear explosive device”. This took place in a “coordinated” way until 2003 – and as a fragmented effort until 2009. Mr Amano said the IAEA had “no credible indications” of Iran researching nuclear weapons-related technology after 2009. America, Britain and France joined the other members of the IAEA board in accepting his recommendation to close the inquiry. The long read for the weekend. Between the end of the war in Afghanistan and the first attack by Al Qaeda to the World Trade Centre span only four years. There are remarkable similarities between this story and the emergence of Daesh. Ending up on the usual hopeful note, there are encouraging news about a novel steel making process. I do not expect this process to replace modern polymers, but it can have an impact on state-of-the-art steel production, i.e., materials that must respect relevant longevity and structural characteristics, but within a tight budget. A music video clip as an extra to this edition. This is the opening track to what is becoming one of my favourite 2015 LPs. Great to see seasoned musicians coming out with such a refreshing sound.